Mattsee is a very pretty market town with a population of approximately 3,000 people in the Flachgau region of Salzburg. 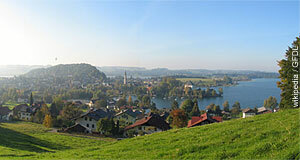 It is situated by a lake of the same name, one of the ice age lakes of the Salzburger Seenland (Salzburg Lake District). Mattsee is well-connected to the capital, even though it lacks a railway link. Its location right by the shores of the lake make it one of the Flachgau′s most attractive destinations for swimming outside of the Salzkammergut - if you can get there by car, that is. Mattsee is a pretty old community and was already prosperous in the Middle Ages. It is known for its monastery and the Stiftskirche, the associated church. The monastery of Mattsee is a Collegiate one, meaning that it has no formal rule - essentially, it is a shared property with several priests living in it. It was founded by the Bavarian Duke Tassilo in 770 A.D. The monastery has not only a remarkable church, but also a museum (Propsteimuseum), a library and a treasury (Schatzkammer). Georg Eder, who was Archbishop of Salzburg until fairly recently, was born in Mattsee. Another sightseeing attraction of Mattsee can be found right next to the monastery: The castle Schloss Mattsee is based on foundations of a castle that was built around 1100 A.D. Today, it houses several communal facilities and a restaurant. The current appearance is Baroque and the rock it was built on is a fossilised coral reef. Schloss Mattsee and its cliff offer a nice view on the lake, opening the way to the next attraction: The public lido Strandbad Mattsee was built around 1930, at a time of optimism and blooming tourism due to the Salzburg Festival. At this time, most of the Salzburg Lake District towns had fancy hotels and enjoyed more attention than much of the Salzkammergut. Today, most of them have developed into borderline-suburbs of Salzburg. Therefore, the lido of Mattsee is an important piece of evidence for a period of exclusive holidays in this area. It is listed as a rare architectural gem. Beyond that, Mattsee offers several good hiking routes around the lake.